Are you looking to rent a party bus and don’t know where to begin? Do you live in the Royal Oak area? If so, then your search is over as here at Rockstarz Limousine and Party Bus we specialize in providing you with the full party bus experience that will make sure that your celebrations are out of this world. 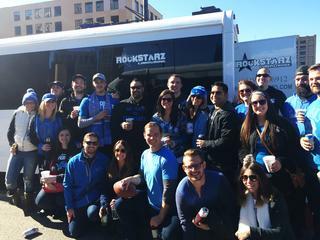 When it comes to a party bus in Royal Oak, you will clearly want to make sure that all of your needs are catered for, and that is what we do. From a professional driver, to a spacious bus that will allow you to invite even more friends and family, you can rest assured that your party will be better than you have previously expected. With our Royal Oak party bus rental option, we will provide you with your own private nightclub for you to let your hair down as you cruise around town. From the state of the art sound system to the stunning laser lights, you will be blown away with the amazing atmosphere that is created in the back of our bus. Individuals have previously sought to use our Royal Oak party bus service for a whole host of reasons, but that is not down to us. Instead, it doesn’t matter if it is for a birthday celebration, an anniversary, or perhaps you just want to have your bachelor or bachelorette party. No matter the reason, our bus will be the ideal location. So, any individual that resides in the Royal Oak area and who is looking for that strange and wonderful place to have a party, then look no further. Give us a call here at Rockstarz Limousine and Party Bus or, alternatively, contact us via our website and we will be in touch as soon as possible to discuss your every needs.